In this article we're going to discuss the qualities of a good father all dads should strive to have. Must I Have ALL these Qualiities? There are many things needed for the success of the family. Along with that for the successful development of kids. Good fathers and good mothers are an essential piece in the equation. Society at times tends to devalue the importance of fatherhood and how critical a father is in the home. We know it's not the case and research on fatherhood says otherwise. I do know as a first-time dad it can be overwhelming. You might not know which quality is essential to develop. To make matters worse many times, the information you receive can be conflicting. We’ve come up with our own list of the best qualities of a father. We hope you’ll find this list beneficial on your fatherhood journey. We’ve covered what being a father means. If you missed it, you should go check it out! For starters being a father can be very challenging. The definition and even the expectations of fatherhood have changed considerably over the past 10 years. Unfortunately, a lot of those changes and expectations have not been for the better. The primary force pushing and defining fatherhood is the media. I want to encourage you to ignore these poor media portrayals. Last and most certainly not the least you love your kid’s mother well. What if I Don’t Have Those Qualities of a Good Father? Many dads out there are going to look at this list and probably start feeling like they’re being judged or worse they’re not good enough. I don’t want you to look at these as the measure of a good father. What I mean by that is don’t look at this as, if you don’t have ALL these traits, you’re not a good dad. First of all, there’s absolutely no judgment here. Secondly, do not beat yourself over the head for not having ALL these qualities. It would be pretty much impossible for one dad to excel at all these traits. Also, many of the traits we’re going to mention will come easier to some fathers than others. Instead, what you should do is look at these qualities or traits of a dad as something to work towards as you go through your fatherhood journey. You’ll never be perfect in all of this. It’s all about trying to be better. You see just because you're not going to be perfect at it doesn’t mean you shouldn’t strive for excellence. What Are the Qualities of a Good Father? This is first and foremost on the list because it's the most important. If you're divorced or a single dad this is going to look a little different for you. So many times, we want to put our kids first and foremost, and it's not the best approach. Your focus should be on your wife (their mom) and nurturing that relationship. I am not saying don't take care of your kids. I am not saying don't love kids. What I am saying is the best way to love your kids and take care of your kids is by making sure your marriage is nurtured and taken care of. When your marriage is good and nurtured your kids, and your family is more likely to be taken care of as a result. No matter how well you love your kids, it doesn’t matter if you’re not taking care of your marriage. With divorce being as high as it is (some estimates say anywhere between a quarter to a third of all marriages (source). We all know by now the havoc a divorce can have on a family and especially kids (source). If you asked most guys what they felt their primary role as a father was, more likely than not they’re going to say it's to provide. This is the stereotypical role of a father. While I should add being a provider is NOT the only role of a dad (as you'll see by this article). It’s an important role nonetheless and part of what we still use to define dads. A good dad needs to help contribute to the household and make sure their family has the necessities. A good dad should be able to hold down a job. By holding down a job, you’re demonstrating to your kids the value of a good work ethic. For the dads that are stay-at-home fathers, you’re not off the hook for providing for your family. The way you provide just looks a little different. When a stay-at-home dad is providing it could be by making sure the kids are taken care of. Or making sure the household is in order. You never have to teach kids how to lie and be bad. They just know how to do all of that. But you have to teach them how to be good. That's where discipline comes into play. Good dads know that they should discipline their kids. They also know it's important their discipline is coming from a place of love (source). You need to be consistent in your discipline. Most importantly loving in your actions. Your kid is going to spend more time as an adult than as a kid. As a dad, your focus shouldn't be on raising good kids but on raising good adults who are productive members of society. This comes in many different forms. One of the ways is by letting kids be kids. Which are often not mentioned enough. Let them enjoy the innocence of their youth, before having the weight of the world on top of them. This is the challenge with parenting and raising kids. You know the end game is to have a well-adjusted adult. At the same time, you have to find a balance between letting them be a kid. But also knowing when they do have to start bearing the weight of the world, you’ve trained them up well enough to handle it. The other way is by disciplining and instilling morals and strong work ethics in your kids. As a father, you're called to be a leader in the home. Nothing will diminish your leadership quicker than not leading by example. Your child is watching you (source). Even when it doesn't seem like they are. Let me tell you…they are! Are you talking about the importance of being polite and respectful but disrespecting your waiter at a restaurant. …or yelling at bad drivers in the car? Are you trying to teach them the value of being honest, but they’ve seen you lie? Your kids are a lot better at detecting B.S. and inconsistencies than many parents would like to believe. Even when they cannot conceptually see it, instinctively they can feel something just doesn't seem right. Think about your childhood and what you noticed when you were a kid. The ability to serve is an important trait. Leading is not just about telling the ones you're leading what to do. It's also about serving them as well. The same concept applies to fatherhood. ➫ Humility is an excellent characteristic of a dad who’s a servant leader. He’s not necessarily after the attention and is ok with others getting the praise. ➫ Hard work and the pursuit of excellence not just in your family but in yourself as well. ➫ Selflessness he’s always thinking about the family. No matter how tired he is, he always seems to have the energy to play with his kids. There are other characteristics of a father who is a servant leader. I would like to dive into this a little bit later, but until then. Dads need to be servant leaders. Which means you're leading with a servant's heart. A dad should strive to be supportive of his kids even when it's hard. This is important both when your kids are young and as they get older. When your children are young, you're building the foundations they’re going to need down the road. As they get older, your support can drive them to excel in their endeavors. Supporting your kids doesn't mean you agree with them on everything they're doing. It also doesn’t mean you shouldn’t try to change some of those behaviors. What supporting your kids does mean is sometimes it's just about loving them where they're at. I've mentioned a couple times about the negative connotation men get when they display what has stereotypically been “feminine” emotions. So, for example crying and to some lesser extent softer emotions like empathy. Instead, the emotions dads get portrayed as having is anger. When they get angry, they then act in a poor manner. Unfortunately, we seem to be starting to normalize some of these poor behaviors. Look at the media portrayals of dads for example. The dads as portrayed by tv shows have the emotional equivalent of a toddler. I’m not saying don’t get angry. You're going to get angry. What’s important is how you act. The test of fatherhood is your ability to handle those emotions. Your kids will be watching and learning how daddy handles situations when he gets angry. In turn, they'll be learning how they should handle situations when they get angry. Discipline without love breeds resentment. A good father loves his kids. Your kids should never wonder whether you love them. Your children should be able to find peace, comfort, rest, and consistency in your love. Patience is a virtue as the saying goes. As a father, your family is going to test your patience on a regular basis. As challenging as it may be, each day you need to pass your test. How you react in those circumstances could be what defines you in the eyes of your kids. For example, the thought of teaching your child immediately comes to my mind. How do you handle it when you’re teaching your kids a skill? What about when your tutoring them and they’re not learning it as fast as you would like? Do you yell at them? Or do you continue to be patient with them? Do you continue to keep encouraging them? Good dads should be a man of his words. His family should be able to count on him. But most importantly, when he says he’s going to do something his family and especially his kids know it's going to happen. If you tell your kids you’re going to be there for their soccer game or football game (or whatever it is) you need to be there. I think compassion doesn’t get brought up enough when it comes to dads. Compassion is sympathy or pity for someone else during their suffering. With that being said can you not see how valuable that attribute is for a dad. Your child for the next 10+ years is going to think the world is ending for every scrapes, bumps, and heartbreaks. You should coach them out of it. You might not think it’s a big deal. Honestly, most of it won’t be, but it doesn’t matter. You were a kid once. To them it is, so try to meet them where they’re at and coach them out of it. Kids love having fun, and they’re good at it. Kids learn a lot through fun and play (source). Even when it’s not about learning, sometimes it’s just about the playing. Remember when I said above let kids be kids? Along with that join them. Dads need to be able to play with his kids, have fun and just enjoy life with them. The expectation for dads is to be present in the family. We’ve already mentioned the consequences of an absent father. Your fatherly role is not just about working and providing for the family. Don’t get me wrong it’s one of your roles and an important one. But it’s not the only role. The interesting thing is to your kids being a provider will not be the most important role to them. What will be, is your ability to be present in their life. Both on a physical level but on an emotional and mental level. It does no good if you’re physically there. But your minds somewhere else. A good dad is proactive instead of being reactive. Being proactive means making changes when you see something that could go wrong. Being reactive is making those changes only after things go wrong. For a dad this can vary from time to time. It could be your parenting style. Maybe it’s your relationship with your children. Either way you want to resolve problems before they become problems. There are many important attributes of a good father. Many of them we didn’t mention. What we did is hit on some of the qualities we believe to be very important. It’s also not a way for you to feel like you’re being judged. 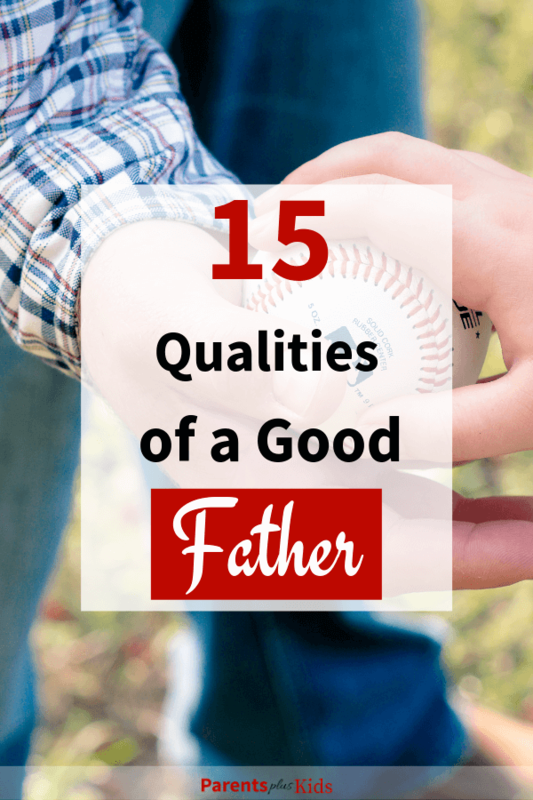 Great dads will probably not excel in all these qualities and traits. But they are still trying. You’ll probably notice that many of these are both qualities of a good father and husband. What qualities of a father did we miss? Please take a moment to share it so we can help other dads.